It has come to our attention that an extremist right-wing group in Greece has been making news lately. That in itself would not usually raise a blip on my radar screen, however this particular group calls itself “Chrysi Avgi” which unfortunately translates into English as “Golden Dawn.” They appear to be a Greek right-wing extremist group, employing many racist, xenophobic beliefs and repugnant tactics. You can read all about them here. There is absolutely no connection between Greece’s fascist Chrysi Avgi political group and the Hermetic Order of the Golden Dawn. The Greek extremist group does not in any way represent the ideals of the Hermetic Order of the Golden Dawn. I would like to state categorically that the Hermetic Order of the Golden Dawn does not support the ideals and goals of Chrysi Avgi or any other extremist political group in any way, shape, or form. Anyone holding right-wing extremist beliefs or sympathies would be both unsuited and unwelcome in the HOGD. The HOGD has no political leanings in any form or fashion. Normally I would not even address this topic. 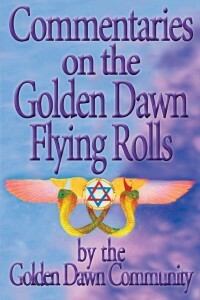 I’m certain that students of the Golden Dawn, the Greater Golden Dawn Community, and even casual students of alternative spiritual paths in general, already know instinctively that there is no connection between a Greek political group and any sincere Golden Dawn magical group devoted to the teachings of Westcott, Woodman, and Mathers. However, in this Internet age of abundant information combined with scant comprehension, I feel that I must act to dispel any possible confusion by the general public. I am happy to report that the 2013 HOGD Conference in Toronto (July 12-13) was a huge success. 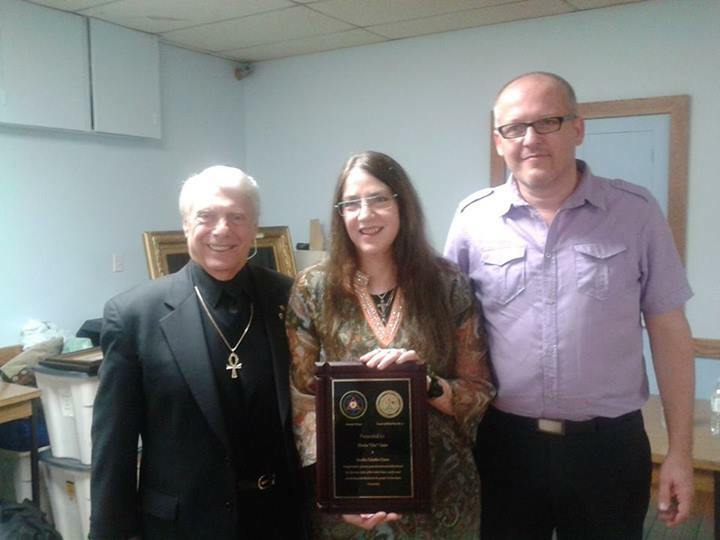 It was well attended and we met some great and talented people from a number of different spiritual paths and magical traditions, as well as other orders within the greater Golden Dawn community. Friday night started off with a meet-and-greet, where Chic and I spent time with old friends and got acquainted with new ones. Everyone present was gracious and their sincerely to the Great Work was beyond question. 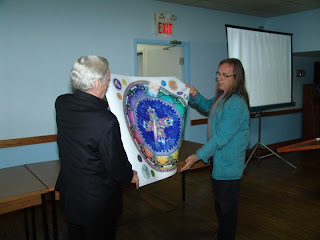 After refreshments, Chic presented his lecture on "An Exploration of the Bornless Ritual," giving an analysis of the origins and development of this ancient and potent invocation that found its way into the teachings of the Golden Dawn. Saturday morning started off with a surprise (at least to Chic) "roast" complete with a PowerPoint presentation of photos and stories celebrating Chic's life and accomplishments. (The roast built on a theme that started at Pantheacon 2013, where Chic was surprised by a dinner held in his honor by the wonderful folks of the OSOGD.) 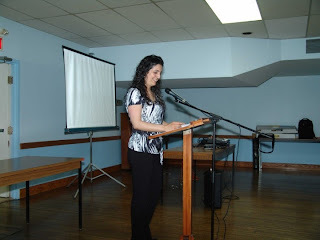 I must thank our hard-working friends at Hermetic Virtues, as well as our Fratres and Sorores of the HOGD in Toronto, who pulled the photos, the narrative, and the PowerPoint together so skillfully. At the end of the presentation, it was my turn to be as surprised as Chic was, when the two of us were presented with a plaque of appreciation. We were also presented with the gift of some absolutely stunning artwork by accomplished magician and artist, Buffalo Bob. A description of the piece can be found here. Much of Bob's work can be found online at the Temple of Agios. The remainder of the morning was taken up by Chic's lecture on the Ceremonial Magic of the Golden Dawn, including audience participation in the Pentagram Rituals and Israel Regardie's Opening by Watchtower. My lectures on Westcott's Enochian Tablets and Tarot Talismans came in the afternoon. Many thanks to all who were able to participate. I've said it before and I'll say it again: Although we may not all be members of the same Order, we are members of the same spiritual path, and the fact that we are able to come together in civility, mutual respect, and fellowship for our common goals of spreading more Light in the greater esoteric community, speaks volumes. Hail, lord Osiris. Hail, lord Osiris. Hail, lord Osiris. Hail, hail, beautiful boy, come to thy temple straightway, for we see thee not. Hail, beautiful boy, come to thy temple, and draw nigh after thy departure from us. Hail, who leadest along the hour, who increasest except at his season. Thou art the exalted image of thy father Tenen, thou art the hidden essence which comest forth from Atmu. O thou Lord, O thou Lord, how much greater art thou than thy father, O thou eldest son of thy mother’s womb. Come thou back again to us with that which belongest unto thee, and we will embrace thee; depart not thou from us, O thou beautiful and greatly loved face, thou image of Tenen, thou virile one, thou lord of love. Come thou in peace, and let us see, O our Lord . . .
Hail, Prince, who comest forth from the womb . . . of primeval matter. Hail, Lord of multitudes of aspects and created forms, circle of gold in the temples; lord of time, and bestower of years. Hail, lord of life for all eternity; lord of millions and myriads, who shinest both in rising and setting. Hail, thou lord of terror, thou mighty one of trembling. Hail, lord of multitudes of aspects, both male and female; thou art crowned with the White Crown, thou Lord of the Urerer Crown. Thou holy Babe of Her-hekennu, thou son of Ra, who sittest in the Boat of Millions of years, thou Guide of Rest! Come thou to thy hidden places. Hail, thou lord who art self-produced. Hail, thou whose heart is still, come to thy city. Thou beloved one of the gods and goddesses who dippest thyself in Nu, come to thy temple; thou art in the Tuat, come to thy offerings . . .
Hail, thou holy flower of the Great House. Hail, thou who bringest the holy cordage of the Sekti boat; thou Lord of the Hennu Boat who renewest thy youth in the secret place, thou perfect Soul. . . . Hail, thou hidden one, who art known to mankind. Hail! Hail! Thou dost shine upon him that is in the Tuat and dost show him the Disk, thou Lord of the Ateph Crown. Hail, mighty one of terror, thou who risest in Thebes, who flourisheth forever. Hail, thou living soul of Osiris diademmed with the moon. You have in the Order notes a list of the 7 rainbow colours and their corresponding notes in the Scale, but I would like to suggest that while the King Scale of Colour is cognate to the Major Scale of sound, the Queen Scale is akin to the Minor, and the Prince to the chromatic. That leaves the Princess unaccounted for, unless we seek out the half or quarter tones of the East. Are they not related to the flecked and rayed colours of the Princess, blurred let us say, one imposed on the other. In actuality, in actually depicting this Scale the colours are represented as sharply divided, but if you consider them clairvoyantly you will see that they waver and mingle as the colours of moving water shift and blend as you look at them, or as lights interplay with the movement of clouds. So on a windy day in Spring have you seen colours interchange in a wood as the young leaves rustle, and the shadows play over a mass of wild hyacinths or primroses. The Princess Scale must always be taken as something changing, unstable evanescent; the flecked and rayed colours should actually be so cunningly interwoven that they would change with each movement of the canvas like shot silk. Now as you consider the Four Scales of Colour, passing imperceptibly from one to another, so must you also learn to pass from one Plane to another, gradually raising and transmuting that upon which thoughts and desires swell. As the colours of the Princess Scale are mingled, and those of the Prince clear, the Queen Scale soft and negative, but those of the King deep and rich, so it is with other things. If, for instance, you con­centrate on Love, you will see how mixed and doubtful a thing earthly love is. But if you raise it up through the aspects of loyalty and devotion, you presently become aware that above, these, lies the pure and selfless ardour of Divine Love. Of the Four Trees you must further consider that two are positive, two negative, two masculine, two feminine. Therefore it follows that two correspond to the waking consciousness, two to the sleeping. But while at the first glance that seems perfectly simple and clear, a little reflection will show you that it is less so than you thought. We have already seen that the Princess Scale which belongs to the lowest of the Four, is negative, must therefore belong to the sleep­ing consciousness. Let us examine this statement more clearly, closely. The Princess in the Tarot is represented as a young person; but a young person from the occult standpoint is one who is yet unawakened, therefore the Princess Tree and Lowest Tree must correspond to one who is as yet immersed in the material. From that it will follow that the Scale of the Princess signifies one who has awakened; how are we to interpret the Queen Scale? This takes us a step further into psychology. An ordinary undeveloped man dreams very little, his dreams are fragmentary; they have no spiritual significance. But when a man awakens to the underlying realities of life, he becomes sensitised, his soul is set free, and he begins to stretch out groping hands in search of guidance. The response comes through dreams, and though he may be unable to bring through clear consecutive memories of his sleep experiences to the physical plane, or brain, yet he can and does receive as much teaching as he can assimilate. This is the vitalising of the Queen Scale. Therefore when you wish to receive teaching on a particular subject during sleep, it is a good plan to dwell upon the appropriate Sephirah or Path in the Tree of the Queen. Of the King Scale it is more difficult to speak, for it belongs to the region of pure light, the source of all colour and music. To that region only the Initiates have access, and that which is re­ceived is in the nature of light and life.